Unlike most logos, which appear in the same form whether in print or online, the Google logo frequently changes its looks, becoming what is referred to as the Google Doodle. The font might change face, or the letters may assume new forms as seen in the Charles Rennie Mackintosh Google Doodle. Perhaps the changed typeface is enveloped within a picture, as for the 250th anniversary of Kew Gardens, or, if you tap the transformed image, the letters come to life, dance or do a little jig, or the picture is animated. For that, see the Google Doodle commemorating the 155th anniversary of the Pony Express. The tap could also prompt a song or a musical extract. For Charlie Chaplin’s 122nd birthday on 16 April 2011, the Google Doodlers produced their first-ever live action video Doodle. If you ‘google’ the archive and search for a specific image, you may find a statement by the Doodler – the creator of the image – about how he or she conceived the image, mentally and pictorially. How did the Doodle come to be? What was the ethos behind the transformation? For the Charlie Chaplin Doodle, the creator, Ryan Germick, explained that Chaplin was one of his creative heroes: ‘Despite being an art-obsessed high schooler pre-emptively bored by anything black and white, I borrowed a VHS tape of Chaplin’s work from the library on a lark. It’s not an exaggeration to say watching it changed my life. I laughed, I cried – I cried from laughter. For the first time I realized the power of visual storytelling.’ Members of the Doodle team starred in the video. With each Doodle and the appropriate link, one will also see a map entitled ‘This Doodle’s Reach’, which shows where in the world this Doodle appears. For example, the Doodle for 13 December 2013, celebrating Canadian artist Emily Carr’s 142nd birthday, reached Canada only. Like many of Carr’s pictures, this Doodle depicts a forest landscape with a slightly foreboding atmosphere. The Google letters are cloud formations, except for the ‘e’, which is a shadow in the trees. It is easy to discover all sorts of wonderful Google Doodles. When the Google search page appears, tap ‘I’m feeling lucky’. In the top left hand corner of the page which next appears will be the phrase ‘Doodles Archive’, press this phrase and voila! – a captivating array of Doodles appears. Doodlers, by the way, do not categorize themselves as artists or designers. The team (roughly ten people) works in a small office in Mountain View, California. They come from diverse backgrounds, such as comic book illustration, fine arts school study and feature film animation. They work with Google employees who have the technical expertise to animate the images and make them interactive. Roughly speaking, a static Doodle may take four weeks to create, while an interactive Doodle may take up to 12 weeks. What is particularly appealing about Google Doodles is that they inspire viewers to learn a little more about aspects of life past and present. Some celebrate discoveries and remarkable events, for example, the 25th anniversary of the fall of the Berlin Wall in 1989. 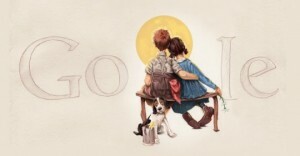 This Doodle featured film footage from around the world celebrating the day. It was accompanied by music composed for the Doodle by the German musician Nils Frahm. In 1989, Frahm was seven years old. Doodles also commemorate people for their achievements, rather than just the achievements themselves, such as anthropologist and archaeologist Mary Leakey; pianist, composer and inspiring music teacher Clara Schumann; and women’s rights campaigner Emmeline Pankhurst. Doodles may also reflect newsworthy days such as International Women’s Day or Earth Day. The latter encourages people to take care of their environment, through educational, public policy and consumer campaigns. You’d be surprised at what you can learn from the Doodle. The first Doodle was a spur of the moment idea from the Google founders, Larry Page and Sergey Brin, while their main product – the Google search engine – was still in its embryonic stage. In an article in Time magazine, by Deirdre Van Dyk, Doodlers Dennis Hwang and Michael Lopez explained the history of the endeavour. On 30 August 1998, when employees left the office for the Burning Man Festival, the logo became a cryptic ‘be back later’ message. Larry and Sergey put the symbol of the festival, a stick like figure with his arms in the air, behind the second ‘o’. ‘They wanted to alert early Google search engine users that the site would be running unattended while they were at the Festival. So they put this up – it’s like a fun “out of the office” message. It was so popular they did one for Thanksgiving.’ The public welcomed the changes, hence Larry and Sergey continued experimenting with the logo, though some people at Google were wary of changing the logo in any case (no pun intended). Advertising experts stress how important it is that corporate branding is consistent so that the product is easily distinguishable from the crowd, signifying its unique quality. If the logo changes, potential buyers might wonder if the product had lost its unique characteristic (s), be this its reliability, delicious taste or social cachet. Instinctively, people are wary of change. Don’t mess with the logo, marketing strategists warn. The idea that a changing logo could become distinguishing was novel. But in time the idea gathered support at Google. Was it likely that people would stop appreciating Google’s services if its symbol occasionally underwent cosmetic surgery? As BBC News noted, according to one of the Doodlers, Doodles ‘humanize the home page’. They make the experience of browsing entertaining. ‘To do the doodles we do a lot of research – we read, look at a lot of clips – we don’t want to get anything wrong,’ says Hwang… ‘We don’t want to mislead the public!’ Think of all the experts who ‘google.’ In 2003 one Doodler made a mistake while depicting DNA, which sparked a powerful reaction. The Doodle came off the site for a short while to allow time for the correction. Doodler Jennifer Hom admits that she’s ‘really afraid of a DNA moment’. One social media site reports Hom as saying that ‘there’s always kind of a responsibility in terms of not offending anyone…We don’t want to put anything too heavy as a Doodle, anything that’s not uplifting’. Over 2000 Doodles have been created so far. Hundreds of millions of people enjoy them. Numerous articles are written in response. The Google Doodlers welcome proposals from the public. Unfortunately, the doodlers cannot respond to everyone as they receive hundreds of ideas every day. Nellie Bly was the pen name for American Elizabeth Jane Cochran, who, among many of her laudable achievements, went undercover in 1887 as a patient at the Blackwell’s Island’s insane asylum for ten days She experienced and later exposed the institute’s deplorable conditions for inmates, many of whom were force fed, subject to beatings and ice cold baths. Her findings, published in a newspaper and a book, ensured humanitarian reform. When Nellie was 25, she travelled around the world in 72 days trying to break Jules Verne’s fictional Phileas Fogg’s record of circumnavigating the globe in 80 days. Why did women have to travel with a chaperone? reckoned Nellie. Brown recreated Bly’s expedition this year as a personal challenge and in order to commemorate Bly’s achievements. The animated Google Doodle is accompanied by an original song composed and recorded by Karen O of the Yeah Yeah Yeahs. I am a little embarrassed to admit that while I was writing this feature, I became hooked on Google Doodles, so much so that one evening I forgot to put the potatoes in the oven to bake. I did discover though that Happy Potato Day is celebrated in Peru where, Google says, potatoes originated. Hopefully, the Peruvians will forgive me. The images portray commemorating the 250th anniversary of the British Museum, and the Norman Rockwell-like Doodle. © Google.